We're at Day 4 of the 12 Days of Giveaways! Our featured author today is J.J. (James) DiBenedetto. I really like the covers for his Dream Series (I think there are almost a dozen of them). For any bi-lingual Canadians (or anyone else who speaks French), the first book in the series has been translated. Welcome, James! The Christmas season is my favorite time of year, by far, and I'm happy to be joining with several other fantastic authors for an event we're calling the Twelve Days of Christmas giveaway! If you've read any of my Dream Series novels, you know that several of them are set around Christmas (DREAM STUDENT, DREAM CHILD, WAKING DREAM and DREAM HOME, to be exact). Christmas gifts, obviously, play an important role in the stories, and I'd like to share a gift with all of you. I've got two neat prizes to give away: a signed paperback copy of one of my novels (winner's choice), and a USB flash drive with ALL the books preloaded on it. All you have to do for a chance to win is click here and enter your name and email address. 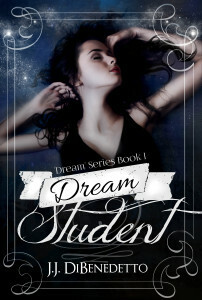 And just for doing that, I'll also send you one free Dream Series ebook or audiobook of your choice. You really can't beat that! And in case you're new to the books, here's the basic idea in a nutshell: what if you could see everyone else's dreams? The books answer that question as we follow Sara, a young woman who has the ability to do just that. Over the ten books of the Dream Series, we see Sara wrestle with this gift (or curse!) and try to balance it with all the other responsibilities in her life. There's romance, suspense, humor and plenty of heart, and I think you'll really enjoy the books! Be sure to check out all the other authors for the fantastic giveaways! There are a total of 24 authors taking part in the giveaways. 12 in the fantasy/sci-fi/paranormal genres and 12 in the mystery/romance genres. See them all here. ​Thanks for stopping by and Merry Christmas!